Summer has finally arrived here in Alaska! Along with the sunshine comes some rain. Rainy days can feel so long being stuck inside all day. My advice, don’t sit inside and waste it, go outside and play! Baby T played in the rain for the first time this week. It was amazing watching her explore and observe this for the first time. Playing in the rain has many positive benefits. Children learn best from their everyday experiences. Taking advantage of playing in the rain opens the door to a wide range of new encounters. Playing in the rain is science! Before attending school, children are taught each subject from playing. Water pouring from the sky is science first hand. This allows children to observe the rain dropping on the ground and develop hypothesis in their mind about why/how this is happening. 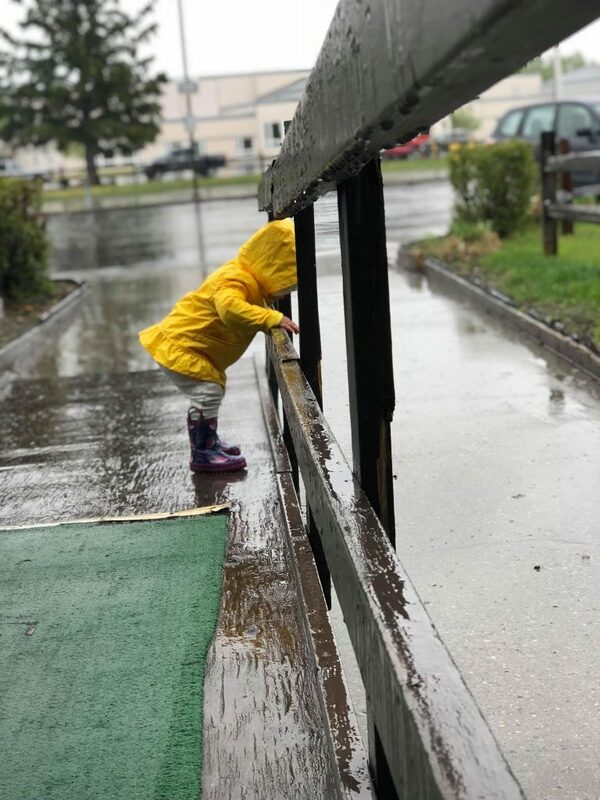 Children develop gross motor skills by playing in the rain. There are puddles every where for them to jump in. The rain also makes the ground very slippery, so children learn to control their balance better. 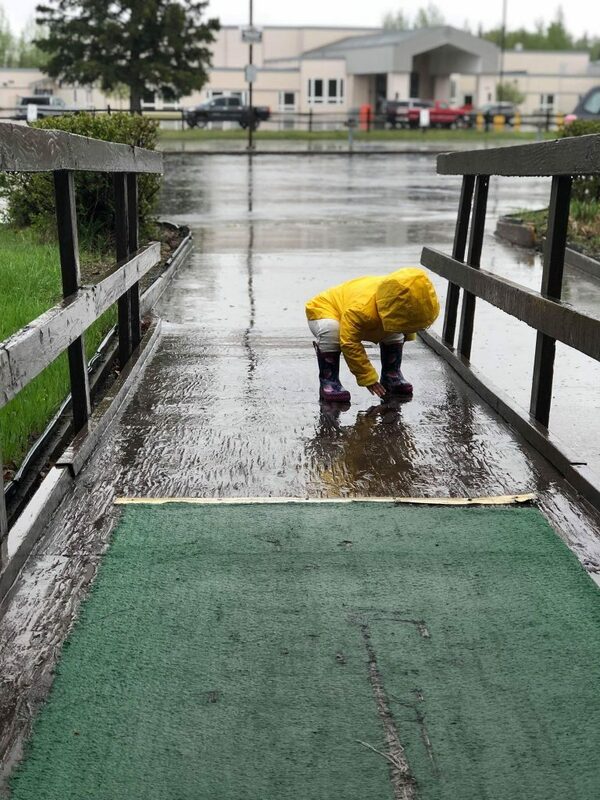 All of a child’s senses are active when playing in the rain. 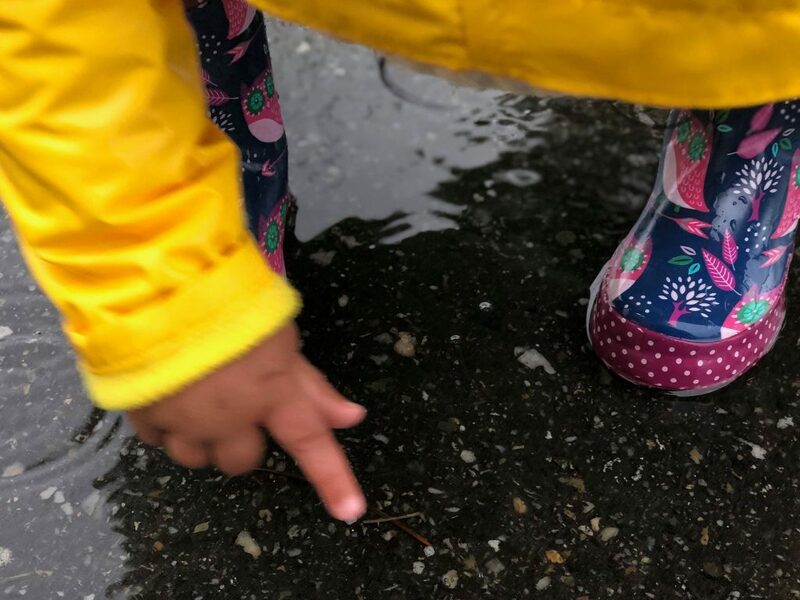 They can see the rain fall out of the sky, hear the water splash when they jump in a puddle, touch the wet ground, smell the fresh scent of rain and even taste the rain dropping on their tongue. Playing in the rain sparks the imagination in unbelievable ways. In most places it does not rain every day, so being able to play when it’s raining helps children’s minds to work. Their mental development is improving as their imagination is working. Being outside/in nature is good for a child’s heart and body. Fresh air, even if it is raining, is relaxing and calming. Children who play outside tend to have better immune systems and brain development. It is important for them, especially nowadays, to unplug and go outside. When going outside to play in the rain your child should be dressed for the occasion. 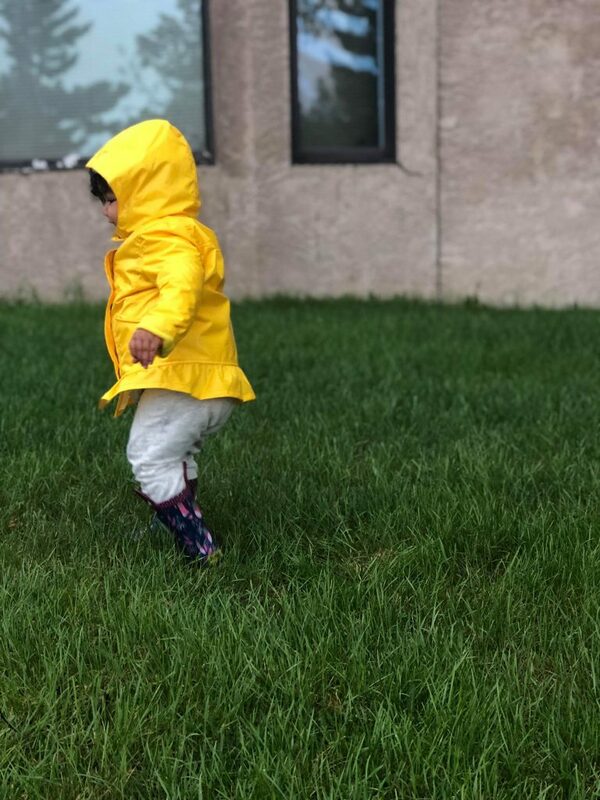 Plus rain gear on a toddler is the cutest thing ever. 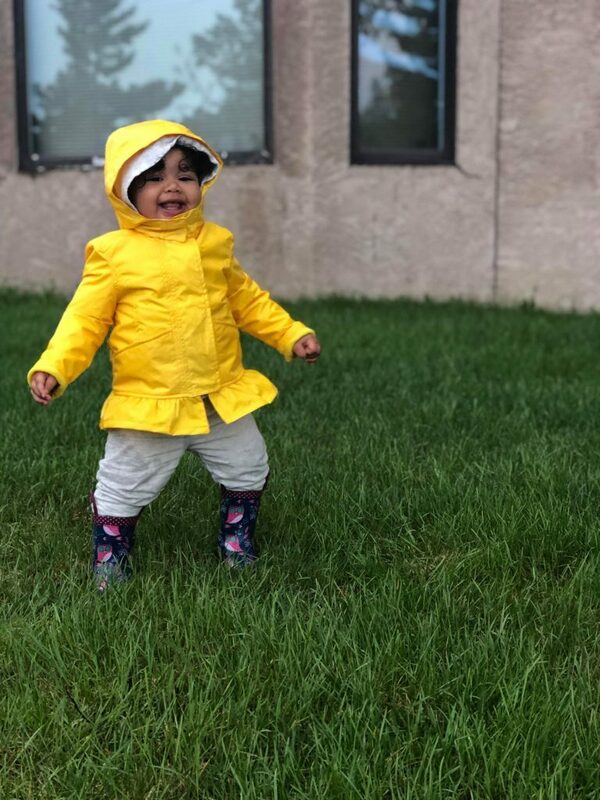 We got Baby T’s rain jacket from Old Navy. It is lined on the inside to help keep her extra warm. Her boots were purchased from our local Fred Meyers. Her boots have handles on them which make them really easy to put on. Both of them have since sold out, but I found some highly rated ones on amazon that are similar. When I worked at a learning center there were two products that I recommended to the parents for rainy days. The first one is a Full Body Rain Suit. These are lifesavers. 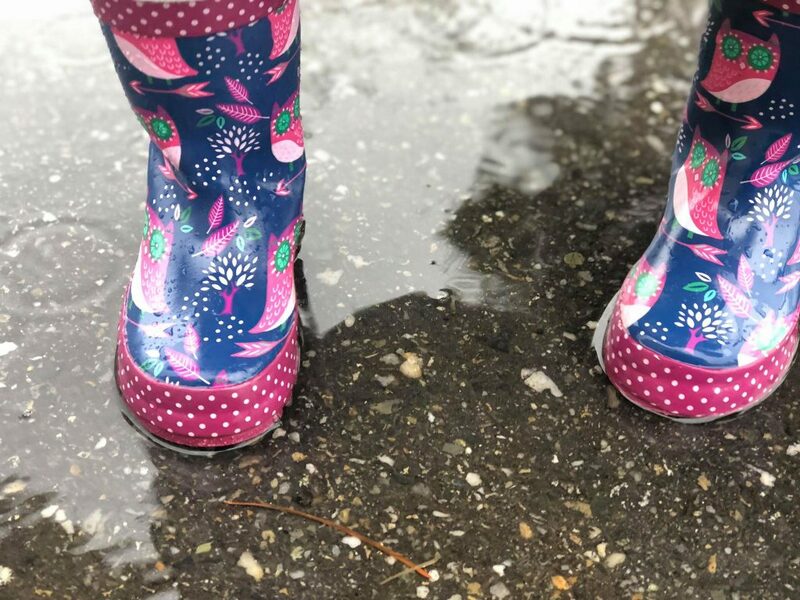 They can be used in the rain or just when it is still damp outside. They keep the child’s entire body covered. I would also recommend Bogs Rain Boots. These boots are a great transition boot for toddlers. They are a softer shoe but they still provide support and are water proof! 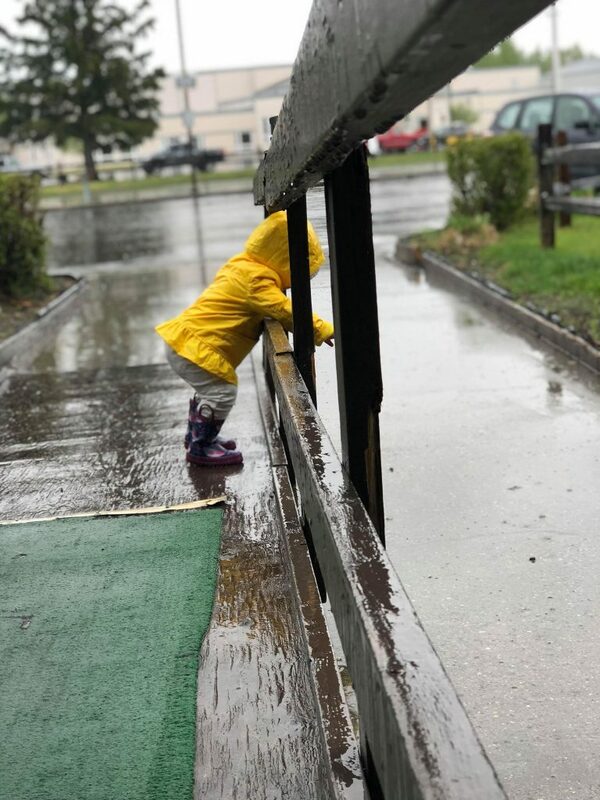 How does your child play in the rain? Nice pictures and post. 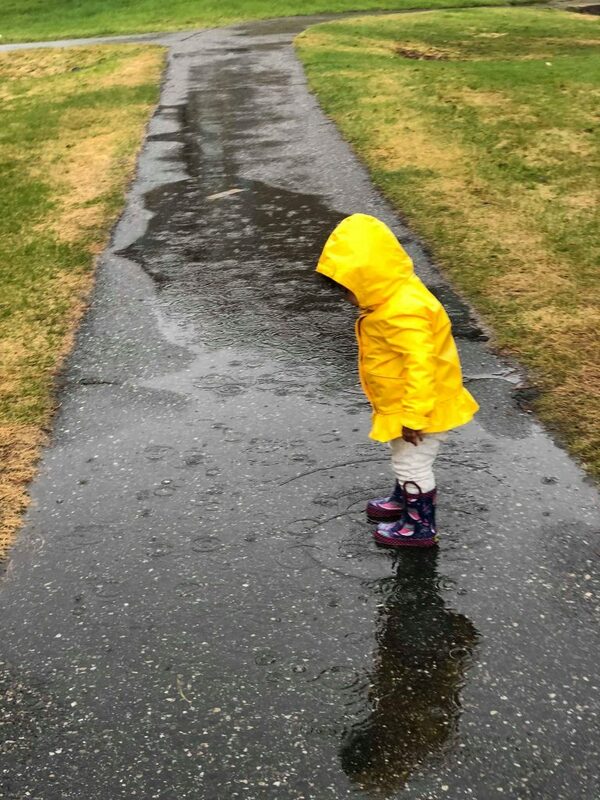 Playing in the rain is a common thing for toddlers. But parents should take extra care when playing in the rain, parents should wear there toddler rain coat and boots. Also keep on home first aid box. If toddler fallen in fever need medicine. Keep always first aid box at home, must be check before provide medicine expiry date.